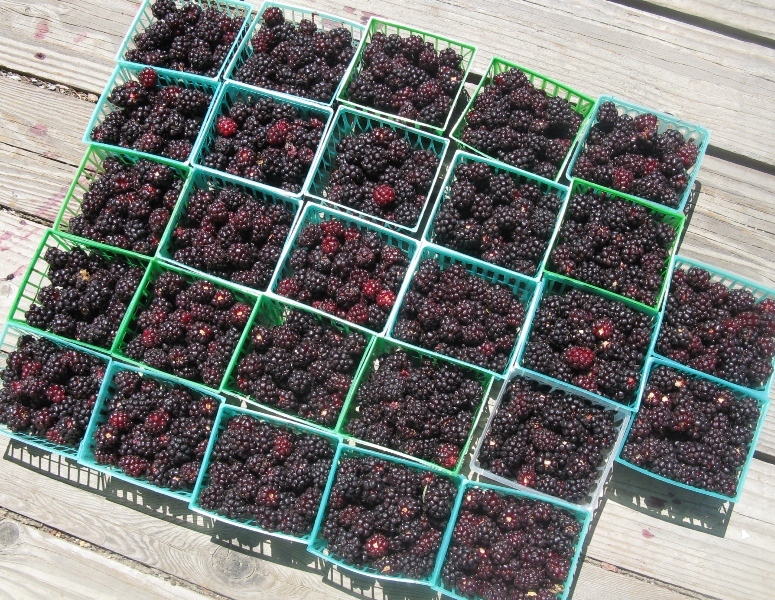 I’m not planning to count every pint of blackberries that I harvest this year. I’m happy knowing that last year I harvested a total of 54 pints of berries. But, my daily record last year was 10 pints, which I harvested on each of two separate nights. That record has now been blown out of the water. Last week, after letting the berries ripen on the vine a bit longer, I had berries falling off the vine waiting to be picked. And so I picked…and picked…and picked. After several hours of picking I have a new daily record: 27 pints. That’s half of last year’s record-breaking harvest, all in one day. Yesterday, when I planned to go out and pick lots more berries, my refrigerator and freezer broke down and I freaked. The only way I can handle all those berries is to freeze some. Fortunately, the freezer was repaired in 24 hours and I’m back in the berry freezing business. 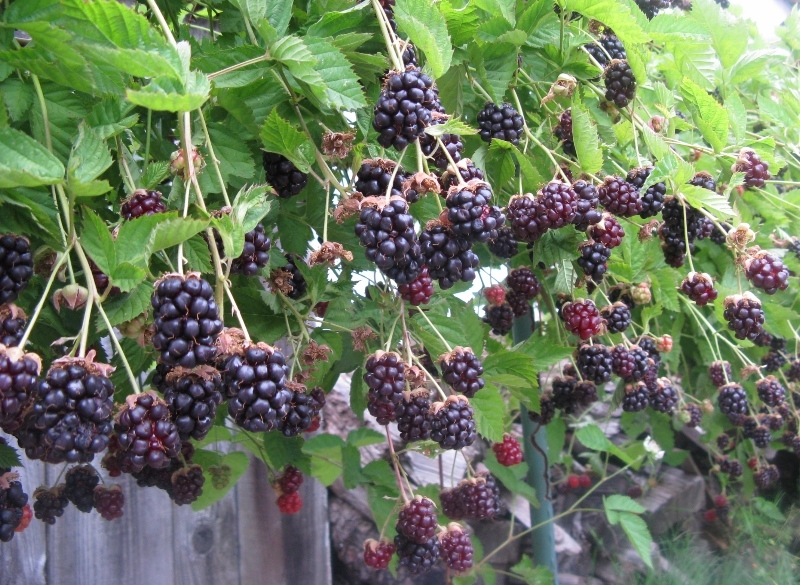 My other berries aren’t yet big producers–heck, I just planted them last year. 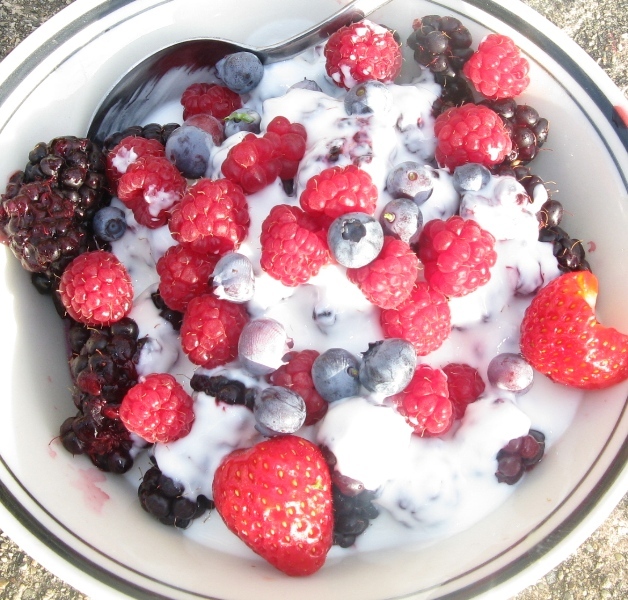 But, I’m getting enough blueberries, raspberries and strawberries to supplement the blackberries. I mixed a bunch with some yogurt tonight for a colorful and tasty dessert.